When I saw the headline “Income Inequality is on the Rise” on the front page of today’s Cincinnati Enquirer, I almost yelled. Why? Because I still remember a time before Occupy Cincinnati when the mainstream media including the Enquirer wouldn’t touch this issue. In fact, that’s largely why Occupy happened. Because the government and corporate media fell all over itself bailing out the Wall Street banks for the crisis that they caused while largely ignoring all the people who lost their homes and weren’t bailed out. Here and there a story about homeowners leaked out but by and large the media and our institutions failed and simply reprinted Wall Street’s “too big to fail” sob story. Now the Cincinnati Enquirer is featuring income inequality on the front page. Without a protest. Do you believe now that Occupy never accomplished anything (still one of the mainstream media narratives)? While it’s true that income inequality has grown since Occupy (so by no means is the work finished) and I could dismiss this with a “better late than never” comment about the Enquirer, I think it helps to put Occupy into a bit of context as far as social movements go (something I wish the mainstream media would do). 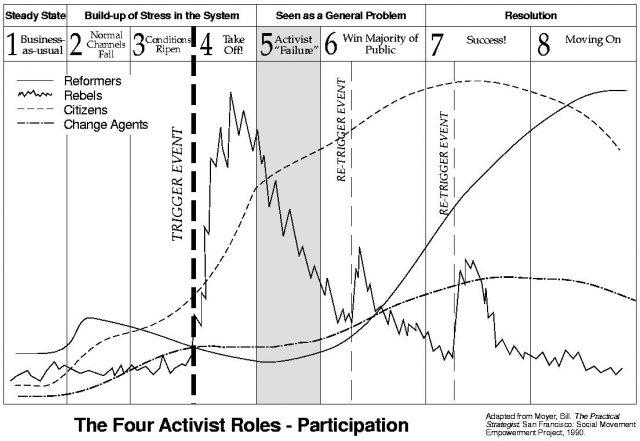 Bill Moyer describes the 8 stages of a social movement as part of the MAP model (Movement Action Plan) for organizing social movements. Now it would be easy to sit around and mope in Stage 5, thinking Occupy was a failure. But the fact that powerholders and mainstream institutions such as the Pope, the President, and even the Enquirer are putting this issue on the agenda show signs of Stage 6 and even Stage 7. Think about this for a second. And maybe congratulate yourself or someone else in the movement for all Occupy has accomplished. Holy crap! I still can’t believe it. Front page of the Enquirer. Never thought I’d see the day they would put income inequality on the front page willingly. Moyer also believes 4 different roles are involved in any social movement: Reformers, Rebels, Citizens, and Change Agents. All are needed and all are important to the movement. People are also very easily capable of performing different roles at different times; so it doesn’t mean a person can’t play multiple roles. For example, a person could be primarily a Rebel in Stage 4 and a Change Agent in later stages. One of the reasons he discusses roles is to talk about how they play out during a movement and where certain roles are most prominent. Rebels, for example, are needed most in Stage 4: Take Off! As the movement progresses, Citizens and Reformers play more prominent roles. If you consider what’s happening in later stages, protests (where Rebels are needed most) diminish as citizens and reformers work to win people over. Not that these won’t still need to occur, just that they tend to occur less. This, however, may explain some of the frustration as some yearn for the days of more active protests or feel as if the movement has died if protests aren’t occurring as frequently and with as many people. This is why I feel it helps to look at the overall process of social movements. When you think about it in these terms, it’s kind of amazing how far we’ve come with recognition and support of the issues facing the 99%. What today’s activists don’t realize is that those past movements were quite similar to those of today and that activists, by and large, felt the same way then as activists today. For the first three years and the last four years of the anti-Vietname war movement, activists felt powerless and depressed. From 1972 to the end of the war in 1975 (immediately following the high-energy years of 1967 to 1971), ever fewer people attended the demonstrations and the war raged as the killing and the bombing increased. It seemd that the decade of movement opposition and the majority of public opinion against the war that the movement created were having no effect on the government’s war policy. But after the war, much of the credit (and the blame) for the war ending was given to the anti-Vietnam war movement. Moyer also acknowledges that there is no end, only the continuing cycle of social movements and their sub-issues and sub-movements. So don’t take this as a declaration of victory. By no means stop … but maybe take a second and pat yourself on the back for some of the progress the movement has accomplished!